Runners up in the awards were Cheltenham College and Front Lawn Junior School, Havant. The awards were presented by Brian Selznick (centre), author and illustrator of The Invention of Hugo Cabret. The winning library was announced in conjunction with the SLA School Librarian of the Year Award at the School Libraries Celebration Day on 1st October. The day highlighted the impact a great school librarian and a well-designed library can make on learning and teaching. The finalists were selected by a judging panel after an in-depth assessment of all the outstanding submissions against a set of design guidelines that included innovation, creativity and resourcefulness. Judges visited all the shortlisted schools and held interviews with the school librarians. 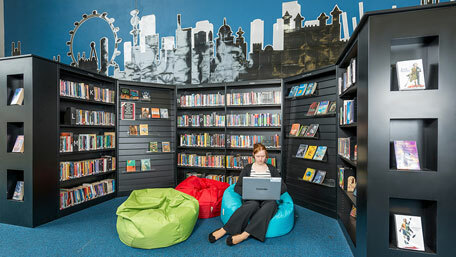 Full coverage of the Library Design Awards on the SLA website. Clips of the Awards ceremony on YouTube.